Who was the most successful Canadian sports team in history? If you guessed Les Canadiens de Montréal you’ve fallen victim to our sexist media coverage. During their 35 year history, the Edmonton Grads set a world record and won 502 of their 522 games. They won the Underwood Trophy, awarded to the best woman’s basketball in North America, every year for 17 years. Undefeated in four consecutive Olympics, the Grads outscored their opponents 1863 to 297. Canadian women’s excellence in sports was evident early on, but this did not result in media support or equality. This page explores why. It wasn’t until the 1880’s that sports really started to open up to women in the form of hobbies. Some sports, such as bowling, were quite popular with women, but women were denied the opportunity to play a lot of sports, especially the more “violent” sports like rugby and lacrosse. These sports were considered “unladylike” and were thought to damage women’s looks. In the past, it was even thought that too much strenuous exercise would harm the female reproductive system. A fact we know to be untrue, as science has proven that exercise is extremely beneficial for all people, including women. Women are now active in university sports and some women even become professional athletes. However, Canadian women, even now, experience a lack of opportunities for participation. In 2010 to 2011 Canadian university sports, males enjoyed 1.9% more participation opportunities in athletics than females. A fact that shows institutionalised inequality still exists. Despite their lack of opportunities compared to men, women have been, and still are, just as successful, if not more successful in athletics. For example, Christine Harder of Winnipeg set two world records in the 400m and 800m Wheelchair Track competitions of the 1993 Paralympics. Another example of women’s athletic success is in Olympic hockey. Since women’s hockey was added to the Olympics in 1998, Canadian women have won medals in 100% of the Olympic games they have participated in, bringing home 3 gold medals and 1 silver. In contrast, men have won 63.6% of the Olympic Games they have participated in and since 1998, have only brought home 2 medals. In present day Canada, there are many non-professional and professional female sports teams, including hockey and soccer. There are also many non-professional and professional single-player sports available, such as tennis and swimming. 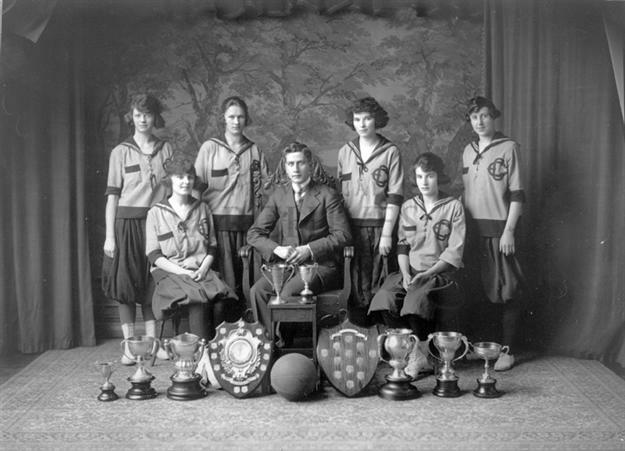 Many organizations have taken upon the challenge of promoting female participation in athletics, such as the CAAWS. Female participation has improved in some cases. For example, in the 1996 Olympics there were 154 women and 153 men participating on Canada’s team. A higher female than male participation rate had never been seen before that year on a Canadian Olympic team. Despite many great accomplishments, women are still facing many forms of inequality in sports especially regarding institutional barriers. One of the institutional barriers of sports in which women are still facing inequality is coaching. There is still a very unbalanced number of female coaches compared to male coaches in Canada. In the 2012 Olympics, for example, 74 of the Canadian coaches were male, while only 19 of the Canadian coaches were female. This is a very significant difference considering the high number of females participating in the Olympics as athletes. Another example in recent years, the Royal St. John’s Regatta’s women’s crews have made up 70% to 80% of the races. In 2010, out of the 5 teams in the female championship race all of the coxswain were male, showing that regardless of the increase in female participation, women are still a minority in coaching and leadership positions. CIS Data on Canadian University Sports Gender Statistics. Source. Another institutional barrier of sports for female athletes is media coverage. Female athletes receive much less media coverage than male athletes, and what coverage they do receive is often sexist with women appearing in provocative poses. Televised sports coverage devotes less than 3% of its media coverage to women’s sports. In the 2001 Canada Summer Games, only 27 of the 124 sports broadcasts devoted to these games solely covered women’s events. In watching any sports broadcasting television show it is evident that there is an enormous lack of women’s sports coverage. Despite Canadian women’s many successes and accomplishments in the world of sports, they are still battling inequality. The many institutional barriers, such as lack of coaches and media coverage, preventing women from full equality in athletics is unjust. Female participation rates are continually increasing and, in some cases, have surpassed male participation rates. Furthermore, women have more than proved their ability to play and compete just as well as men, winning countless awards and even setting world records. – Canadian Association for the Advancement of Women and Sport and Physical Activity is an organization that promotes female participation in athletics and has working been working on the issue for over 30 years. – Women’s Sport from 440 BC to Present is a particular page from the CAAWS organization’s website that outlines women’s sports achievements throughout history. – Women’s Sports Foundation promotes the advancement of women through sports and physical fitness, providing women’s sports news, programs and research. – Ryerson Review of Journalism: Sticking it to Women’s Sports is an article that explores the lack of media coverage in Canadian women’s sports. – Hockey Canada: Team Canada (Women) shows Canadian women’s achievements in professional hockey. Hey Danielleyy!! Totes rad info!! Loved this very interesting and insightful read!! You are very SMRT!! (I can’t smell smart) ;p Hope you got a good grade 🙂 Say hi to Furby for me! !